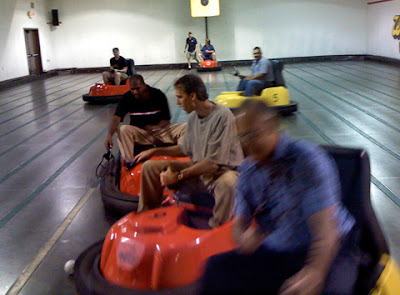 A bunch of us blew off a Wednesday night with our families and endured a God-awful commute up 400 to play Whirly Ball with our fellow teammates and some of our Vallero & Stanley customers. Despite the bruises I received from the crank they call a steering wheel, I had a lot of fun. I learned that we actually broke a record, too. According to the referee, we are the first group in his experience to ever score 0/0. So that's something. Cause all in all, we really sucked. But to be fair, this game is NOT easy. But after a few beers, no one really cared that we were barely scoring. I think everyone had a pretty good time. Hey we used the same pic! I had to do it. It's All Fun and Games. . .
She'll Never Know . . .